Spring cleaning is still going on here, and has spilled over into my Sims 2 workspace. I've been trying to clear out all these half-finished projects so I can focus on a couple of pet research ideas. 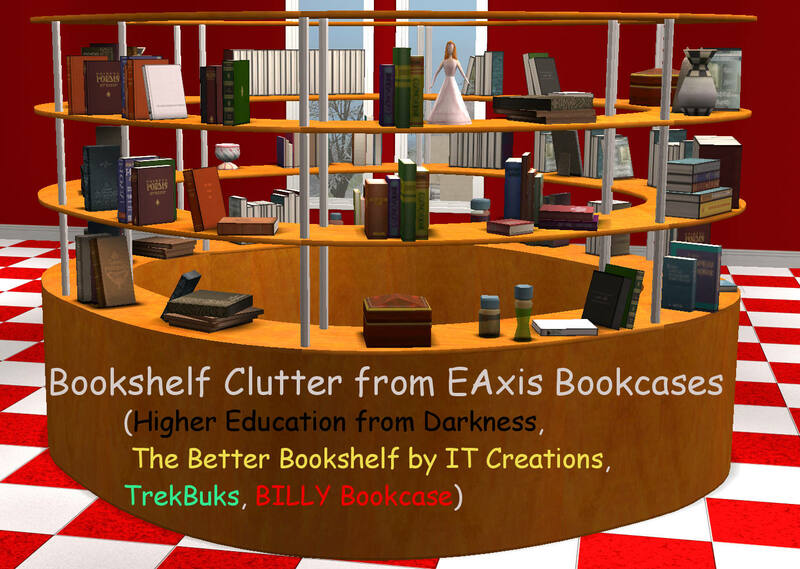 This one has been hanging over my head for a while - the completion of turning all the shelf details from the EAxis bookcases into modularized deco sculptures that simmers can place at will to customize empty bookcases, tables, or anything with a slot. These four sets - Goth, Tech, Elite, and BILLY - should bring this little exercise to an end. 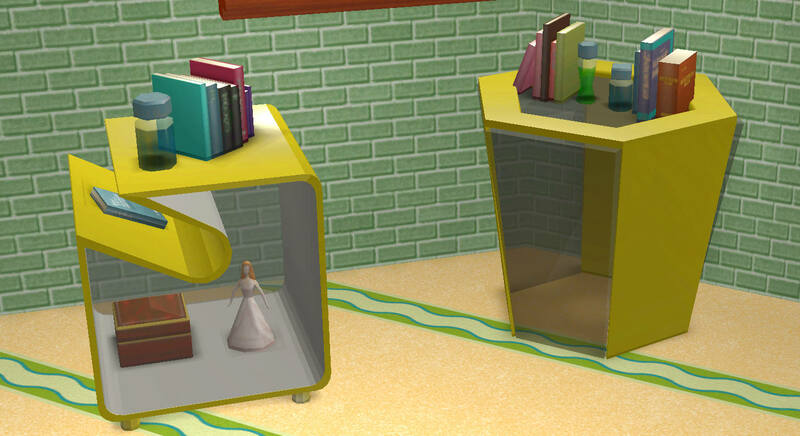 -- These sets are from non-basegame bookcases, but these deco objects are made to work with basegame setups, as well as with any combo of EPs and SPs. 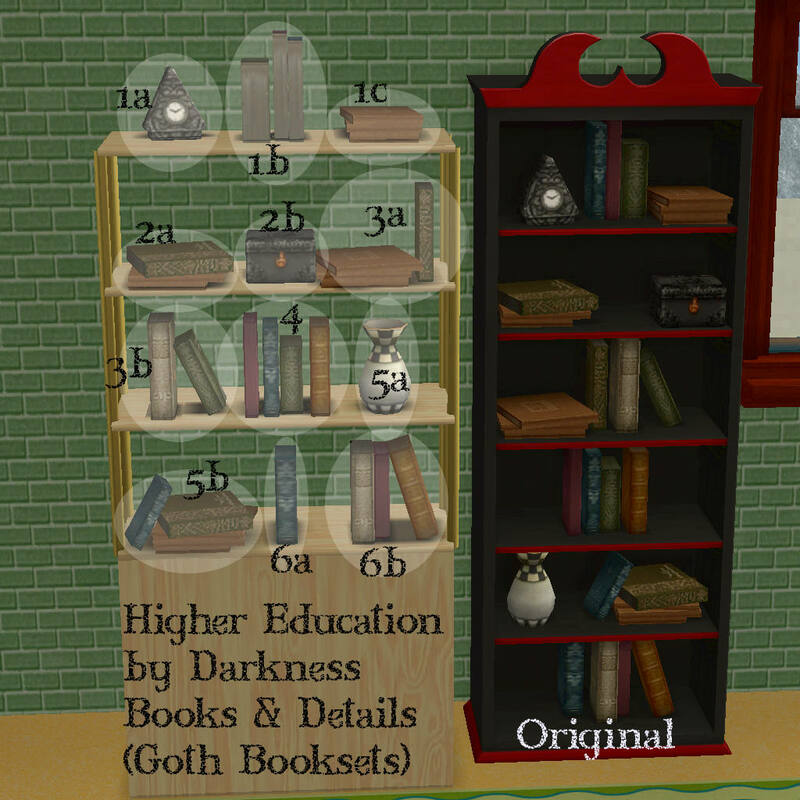 Therefore, they are NOT repositoried (slaved) to the original bookcases and their recolors. 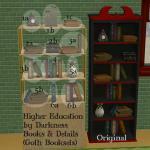 -- each of the four sets are repositoried to the 01(a) meshes. (You need to have the #1(a) mesh of each set in your downloads folder for all the other subsets to show textures or recolors.) 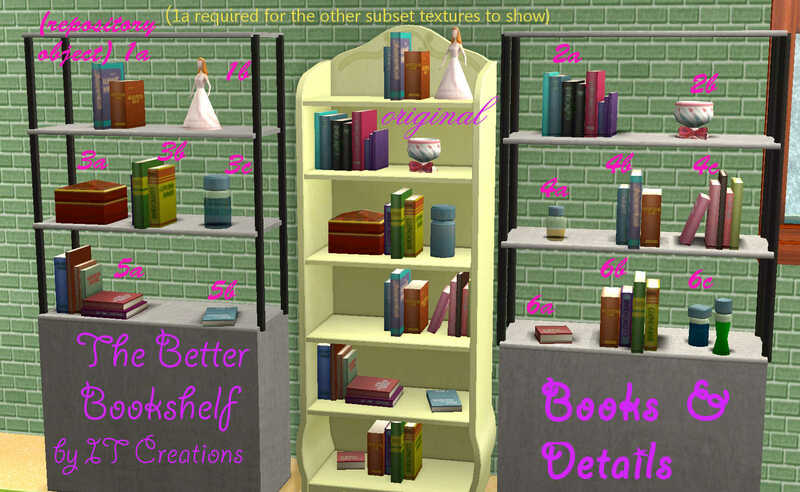 There is a slight exception in the case of the Better Bookshelf set: I added some transparency to the bottle (mesh 03c) as well as creating a couple of new bottle meshes. They are all slaved to the 01a mesh for textures AND slaved to the 03a mesh for the material definition that allows them to have transparency. 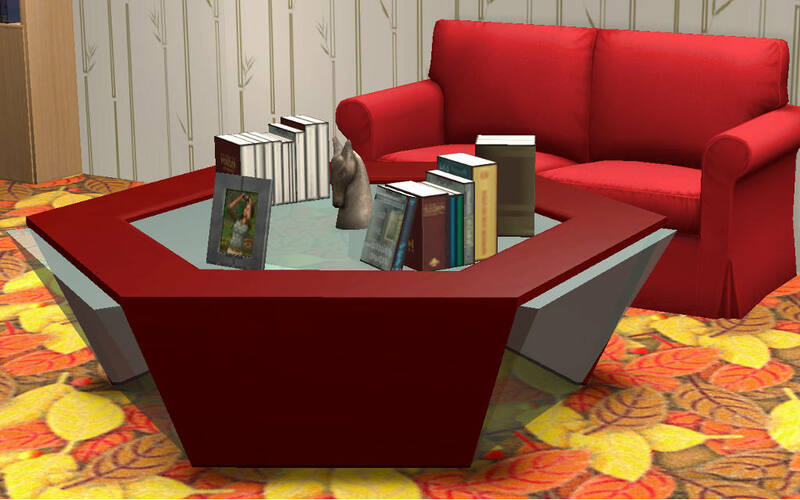 -- There is an extra .rar that includes collection folders for each of the booksets I've uploaded. They are not essential, but will help in finding all this minutiae as well as making it possible to clean up your buy mode a little. 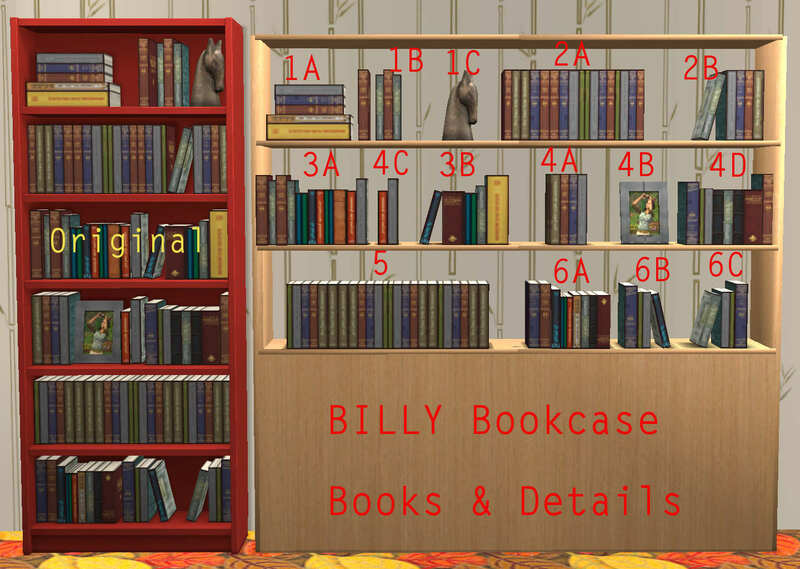 There are also collection folders for previous booksets I've uploaded, which can be found here , here , and here . 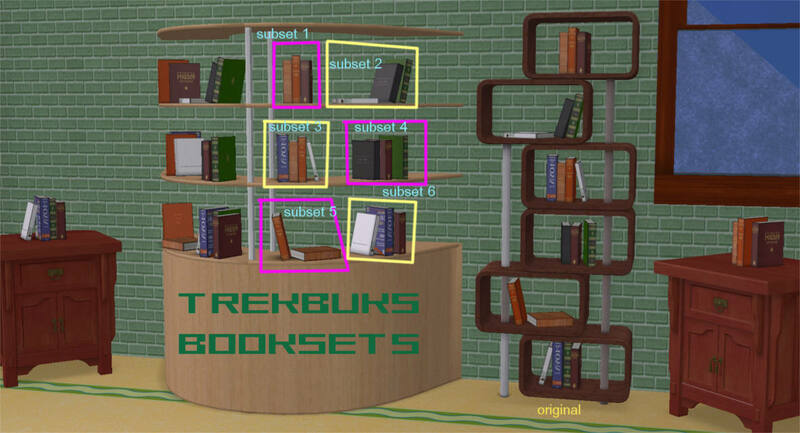 All meshes and textures are either directly taken from EAxis game objects or slightly altered in GIMP and /or Blender. I make no claim on these meshes at all. Do with them as you will. All packages have been Compressorized (thanks jfade) and tested in both a fully loaded game (all EPs and SPs) and my basegame (actually Double Deluxe). 94 people have said thanks to d4RE for this download. Nursery Add-Ons II: A rocking chair and Haffa Crib recolors. Nursery Add-Ons: Spruce up your BG and FT nurseries.